LOS ANGELES—What a difference a day makes. 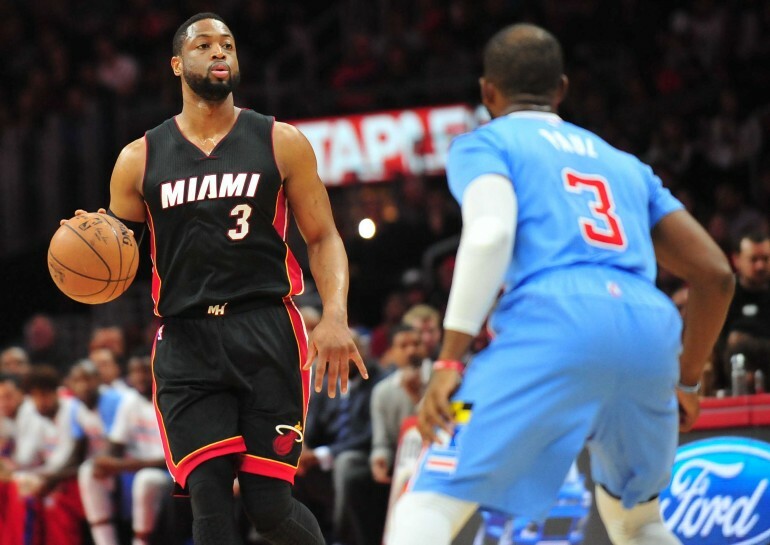 24 hours after demolishing one of the best teams in the NBA, the Clippers struggled with the Miami Heat and fell 104-90. Chris Bosh scored 34 points, Dwayne Wade had 17 points and 10 assists, and second year Miami center Hassan Whiteside was the most dominant player on the court on Sunday finishing with a career high 23 points, 16 rebounds and an astonishing +23 point differential while he was on the court. Going into the game, the seldom-used Whiteside was averaging 5.3 points and 4.9 rebounds on the season. One day after defeating the Dallas Mavericks 120-100, which many touted as the Clippers best, win of the season, they slept walk through the second quarter against Miami and were outscored 32-24. Blake Griffin had 26 points to the lead the Clippers and Chris Paul finished with 23 points and 9 assists. After six players scored in double-figures on Saturday against the Mavericks, only three players scored in double-figures on Sunday. J.J. Redick had 14 points. The Clippers were out rebounded 43-26, and there was a glaring differential on the offensive glass 15-6. DeAndre Jordan struggled against Heat centers, Bosh and Whiteside. DJ didn’t score his first bucket til the final few minutes of the second quarter and finished the game with just 4 points and 6 rebounds. Bosh hit a back breaking three-pointer with 1:43 left in the game to give the Heat a double-digit lead 100-90 and sink the Clippers. The Clippers had cut the lead to seven and Paul missed a three-pointer that would have cut Miami’s lead to four before Bosh hit the dagger three. The Jekyll and Hyde Clippers once again showed their ugly side against a 15-21 Heat team that has been disappointing all season. The Clippers started the game on a 19-6 run, but surrendered the lead at the end of the first quarter and the Heat never looked back. In their defense, Los Angeles had less than 24 hours to prepare for the game, whereas Miami had four days off to attack the Clippers in the half court. Whiteside finished just three rebounds away from the Heat’s all-time rebounding record by a bench player (19 Jamaal Magllore). The Clippers conclude their nine game home stand, their longest of the season, at 6-3.